Introduction: Alzheimer’s Disease (AD) is a progressive neurodegenerative condition in which individuals exhibit memory loss, dementia, and impaired metabolism. Nearly all previous single-treatment studies to treat AD have failed, likely because it is a complex disease with multiple underlying drivers contributing to risk, onset, and progression. Here, we explored the efficacy of a multi-therapy approach based on the disease risk factor status specific to individuals with AD diagnosis or concern. Methods: Novel software from uMETHOD Health was designed to execute a precision-medicinebased approach to develop personalized treatment recommendations with the goal of slowing or reversing biologic drivers of AD. AD-associated inputs encompassed genomic data, bio-specimen measurements, imaging data (such as MRIs or PET scans), medical histories, medications, allergies, co-morbidities, relevant lifestyle factors, and results of neuropsychological testing. 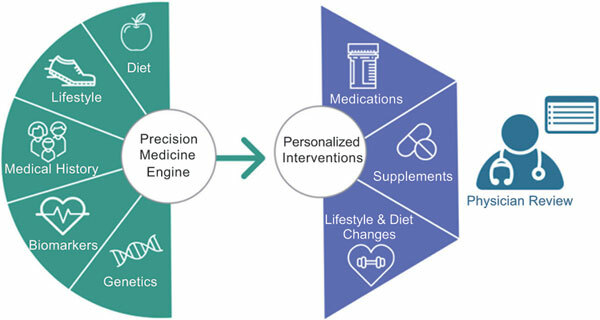 Algorithms were then employed to prioritize physiologic and lifestyle states with the highest probability of contributing to disease status, and these priorities were incorporated into a personalized care plan, which was delivered to physicians and supported by health coaches to increase adherence. The sample included 40 subjects with Subjective Cognitive Decline patients (SCD), and Mild Cognitive Impairment Patients (MCI). Results: Software analysis was completed for 40 individuals. They remained on their treatment plan for an average of 8.4 months, equal to 2.8 iterations of care plans. 80% of individuals overall showed improved memory function scores or held steady, as measured by standardized cognitive evaluations. Cognitive assessments showed significant improvement in the SCD group (Composite P value .002, Executive P value .01), and the CNS-VS Executive domain showed significant results in the combined group as well (P value .01). There was also biomarker improvement over time observed from the blood panels. 8 out of 12 selected biomarkers showed slight, though statistically non-significant, improvement overall for symptomatic individuals, and 6 out of 12 for the overall population. Only one biomarker, homocysteine, showed significant improvement, though (P values .03, .04, .002). Conclusions: Our analysis of these individuals lead to several interesting observations together suggesting that AD risk factors comprise a network of interlocking feedback loops that may be modifiable. Our findings indicate previously unidentified connectivity between AD risk factors, suggesting that treatment regimens should be tailored to the individual and multi-modal to simultaneously return several risk factors to a normative state. If successfully performed, the possibility to slow progression of AD and possibly reverse aspects of cognitive decline may become achievable. Alzheimer's disease, mild cognitive impairment, precision medicine, combination therapy, software, treatment.